A powerful and versatile instrument that offers quality and bags of canny design upgrades for extremely sensible money. Supremely flexible tones. Excellent value. Powerful. Danny Bryant is at a point in his career where he knows what works for him and what doesn't. A Fret-King player already, he jumped at the offer of a signature guitar. Danny wants power and variety and his signature model is loaded with three different pickup styles. We have to say the DBR looks regal in Candy Apple Blue finish over a three-piece American alder body. One great advantage of a Wilkinson-designed guitar is the customary inclusion of Wilkinson-designed hardware. So, it's no surprise to find a WPV steel-saddled, two-point floating vibrato and his laughably simple but incredibly good E-Z-Lok tuners. Danny Bryant's involvement with the brand goes way back, so he's chuffed with his new baby: "I've been playing Fret-King guitars on every live show and recording session since I acquired my first Corona SP60 back in 2005," he enthuses. "So to have my own model is a huge honour." "The slanted 'humbucker' at the neck is in fact a pair of single coils wired together"
The slanted 'humbucker' at the neck is in fact a pair of single coils wired together, while the bridge P-90 is stacked, also allowing it to 'buck the hum'. In the middle is a WHS single coil, and the four power plants are wired to single volume and tone pots, plus Wilkinson's clever Vari-coil; as it's turned down, the P-90's humbucking tones fade to single coil, a great secret weapon for any guitar. The DBR's neck profile is vintage 'V' and, mated to a fingerboard with 22 medium- jumbo frets, provides a different feel entirely to the Verity model. Although quite pronounced, the V is feathered nicely into the meat of the neck so there's no uncomfortable ridge. V-shape necks demand more of a 'dig in' attitude to get the best from them, and while in no way a struggle, this one does not play you; it demands you put in some effort to get the most out of it - as Danny Bryant does. Plugged in through a Marshall 1974X, the DBR's inherent voice does not lack heft. The bridge P-90 is fat and full of colour but remains articulate, even with a Boss Blues Driver kicked in. Flip across to the neck single coil and it's the sound you'd automatically expect, but in no way dwarfed by the size of the P-90. With both neck pickups on things get even bigger; clean, the tone is warm but with no fuzzy edges, and with the Driver engaged it arrives somewhere between Clapton's signature boost and Gary Moore's Still Got The Blues. "There's so much here it's not true, from power rock to funky blues, and the intuitive nature of the whole setup is a huge bonus"
If it's Texas blues you want, try the middle position; this selects one neck single coil along with the bridge P-90 for a lovely balance of warmth and cut, especially when using the Vari-coil to dial a smidge of humbucker out. All the pickups sound individually great, but position 2 (bridge and middle together) is now more baritone than tenor; knock back the tone pot, kick in the Blues Driver and you're in Schenker City! "The DBR incorporates aspects of every great usable sound I've ever wanted. From crystal-clear single coils to a full-on screaming humbucker, from a fat vintage-sounding P-90 to a country-style twang, this guitar really does it all - and with class." Yep, we'd go with that. Danny Bryant's DBR is as mean a machine as you'll find within this configuration. 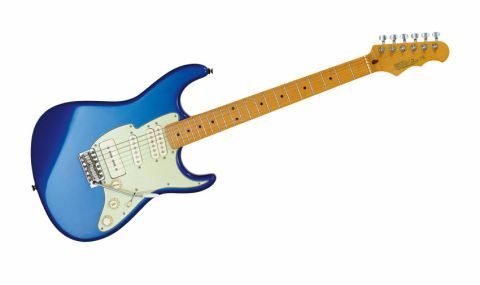 For the modern blues-rocker, it's perfect, but we can see many a function-band guitarist ditching two or three instruments to replace them with just this one. Bryant sums his feelings up, saying simply: "Trev Wilkinson has created the guitar I always dreamed of someday finding." Yes, of course he would say all that, wouldn't he, but at this price we'd find it hard to point you towards a better all-rounder for the money.